The Kruse Chronicles Continue in New Mexico: Bathroom Re-do Time - Decisions are Made! This is one of our bathrooms. 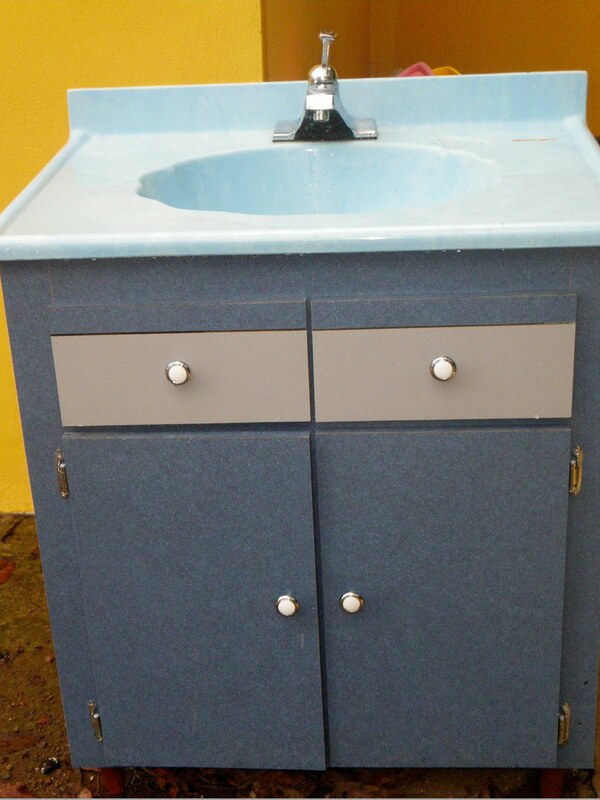 It is a typical, regular sized bathroom (5 x 8) and we aren't doing anything dramatic - but come on, it is a little bit blue! 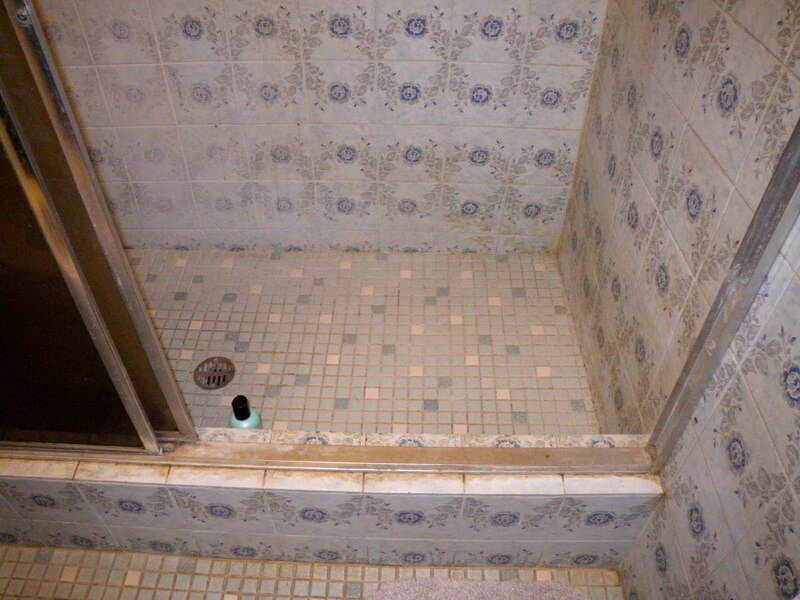 In its time (30 years ago) this was probably a good design, but 30 year old grout just doesn't ever get clean and the color - well, take a look. I had no idea how difficult decisions would be though. 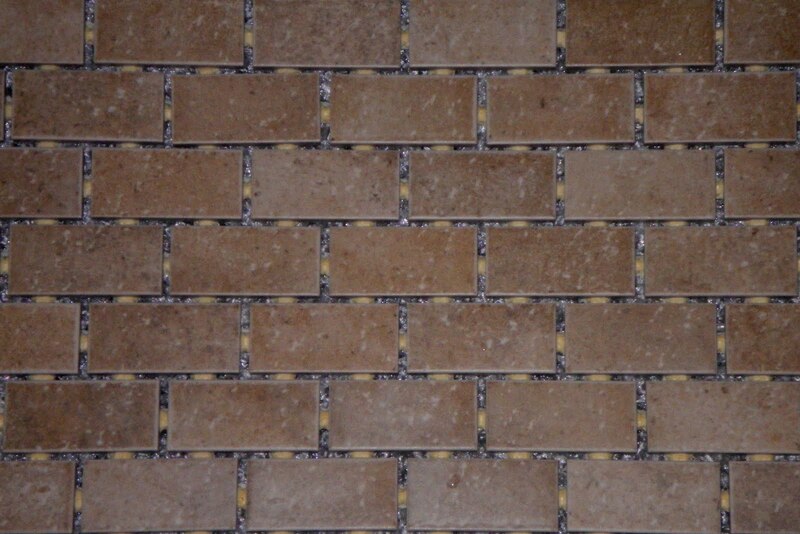 In my logical mind I thought I'd be able to find one color/texture of tile that would come in several sizes and several shades and that things would "match." This is not how tile works. Everything has a different texture/design to it and nothing matches. Hard to have a simple, clean design when everything is different! Right now the inside of the shower and the outside floor has little 1 by 1 inch tiles. I want as little grout as possible, but in a small shower you can't really put large tiles. Since we aren't tackling this job ourselves I want it as easy as possible for the guy who does it so I am going with 2 x 2 tiles that are in a 12 x 12 square. 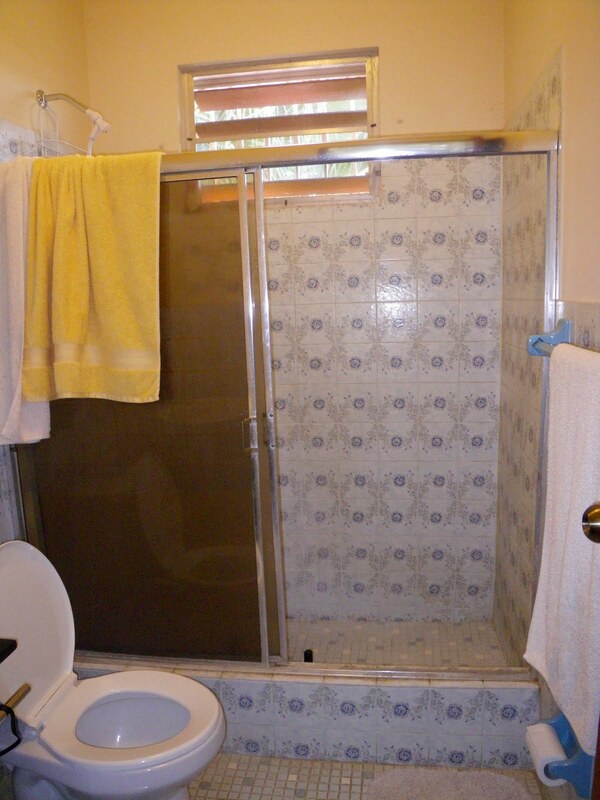 The shower doors are nasty, and metal just doesn't work here. I want low maintenance so I want glass blocks that don't move. I'm going with 8 x 8 x 4 since the wall they will sit on is a little over 4 inches wide and that will let me do a wall around 4 blocks wide and probably 8 tall. It won't block the window, will have no moving parts, will keep the toilet from getting wet and look a little more modern (I hope). The tile doesn't go all the way up the walls and we aren't changing that. I want some wall space so I can transform boring beige (commonly called "neutral") by painting color on the walls and getting colorful towels. I'm also thinking practical and will have a towel bar inside the shower to hang bathing suits on since this is a weekly occurrence. The floor is also the 1 x 1 inch tiles and I am going with 16 x 16 inch big ones. Less grout means easier cleaning, because I don't care if you put sealer in the grout or not grout will always get nasty in the end! This is the old sink and vanity. Kinda blue! There was a lot of room to store stuff, but luckily I'm not much of a girly girl so I can live with less. There was a grey/blue toilet when we arrived but we switched it to a low flow white one in the first couple months. So the new scheme will be boring beige. I am drawn to all the cool Caribbean colors like turquoise, oranges, yellows, greens and blues but know better after doing wild colors in our previous house. This is the "accent" tile - two rows will go on top of the wall tile for contrast. It is the same shade as the tiles in the shower and should connect things well. The light beige 8 x 12s are for the walls and the mixed beige 2 x 2s for in the shower only. 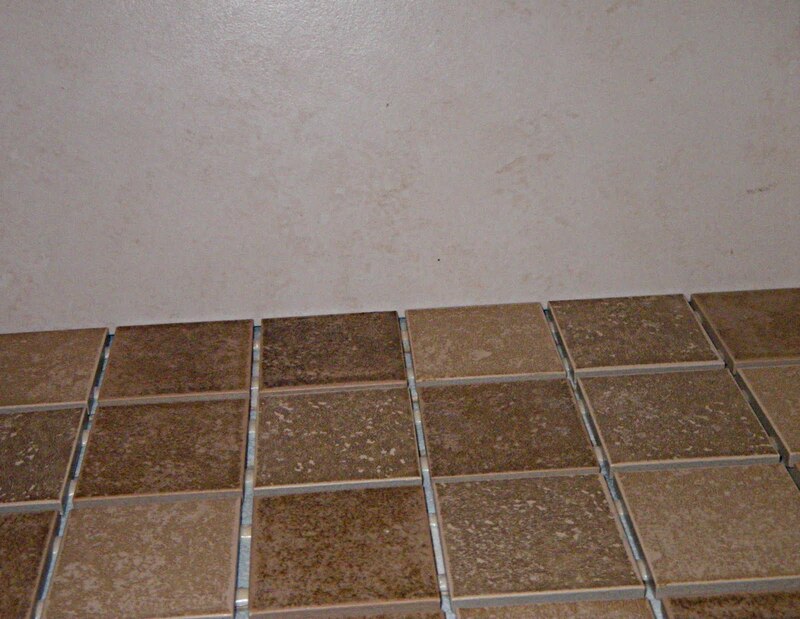 The floor outside the shower will look like the lightest beige of these only will be 16 x 16. I love the new sink/vanity. We found it here - in Puerto Rico - if you can believe it! It is modern but still practical. It hangs on the wall (so you can sweep and mop under it) and has room for a soap dispenser and toothbrush holder on top. 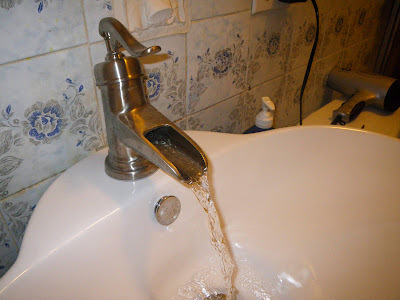 My favorite part is the bamboo-like zen faucet that conserves 5% more water than other ones but mainly I just like that it is a wide stream that sounds neat. Jeff also hooked up the hot water here too which is nice this time of year. So now the hard part. Who to hire? We've never had any one do work on anything so it is an adventure. All the old tile has to get chipped out and after doing some of it I decided I would rather hire it done than flying glass-like shards in my hair and clothing. This also means a trip to Fondo Seguro for insurance in case the guy chisels his leg off or gets tile shards in his eyes if he doesn't wear goggles. Things are different here definitely...we'll see how this goes. If it goes well, we have a harvest gold bathroom that needs upgrading as well...then there is the kitchen...I'm exhausted thinking about it. Guess I'll go outside and build something! Cool! Have fun with that (in a way it's fun to see the transformation, I think). It's interesting that YOU have to buy the insurance. In the states the contractors have to have their own. 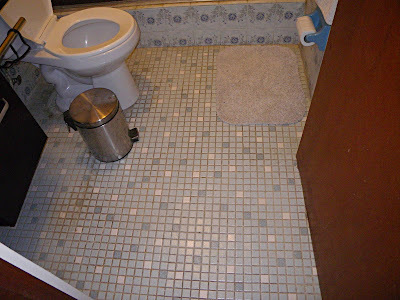 I think the small tiles on the floor aren't too bad, but the blue rose ones are pretty funny, especially in combination with the other type of tile. I like your modern sink and faucet those are awesome and I think they'll look good together with your new "neutral" tiles. It will look really nice when you're done. I don't even know where I'd start for finding someone. We called carpet exchange for our tile and floor work on the new rental. Are there places like that in PR? Hi Katrina! I'm glad you are tackling the bathroom. 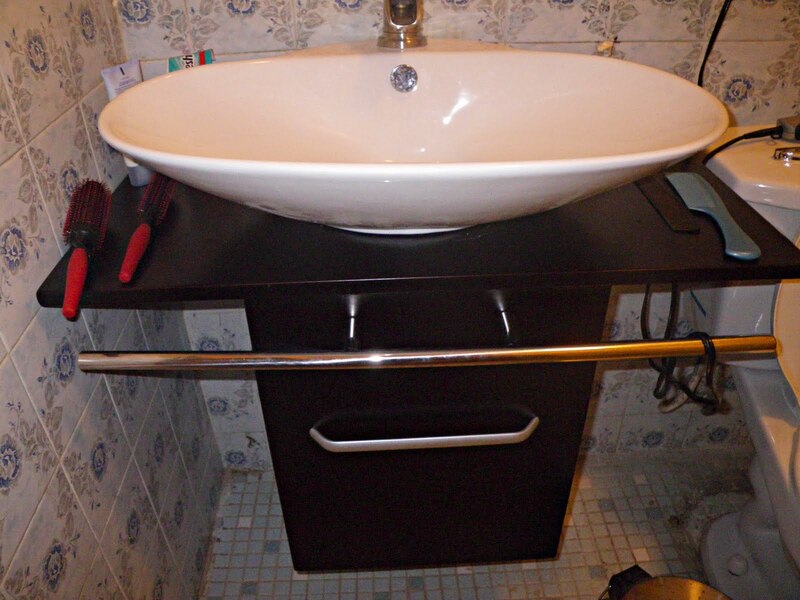 I suspect once you see the results, you will get enthusiastic about the other bathroom and the kitchen. The old color scheme is like a blast from the past. Those colors had their day long time ago, LOL!, back in the 70's to be exact. I think they came after the avocado green and orange phase here in mainland from the 60's. Remember the hunter green and burgundy phase of the 90's? I guess each decade has its color scheme. I really like what you have picked, I think it will be awesome when done! Hopefully, you'll find someone that is fluent in English to do the work. Good luck! H Jr.
Cassie - Home Depot does this sort of thing and they have their own workers comp insurance I believe. Finding reliable help anywhere is hard but is harder with a language barrier! We could do the floor ourselves but removing the old ones is awful and getting them vertical on the wall? no way!